You want to impress your Instagram subscribers with an extreme photo but you don’t want to take the risk? There are secret places on our planet where you don’t need to be that brave to take a picture that will be liked by millions of people. We at Bright Side decided to find several epic places for photo shoots all around the world that are breathtaking at just the right angle. This small rock called Pedra do Telégrafo is not far from Rio de Janeiro. From it, there is a beautiful view of the Atlantic ocean. You can take a cool photo without any danger if the angle is right. It will look like you are hanging off a very high cliff but in fact, the distance between the edge and the ground is no more than a few feet. Anyway, you should be careful: it could be easy to slide off and roll down the hill. Pedra da Gávea is a rock in Rio de Janeiro that sits at a height of 2,762 ft. There are a lot of spots where you can take a breathtaking photo with a view of the city or the beach. But some places are really dangerous. Photos should be taken with all possible safety precautions, which you can later edit out in Photoshop. There is a small ledge where you can take a safe but still cool picture. If the angle is right, it will look like the rock is right over the ocean even though the distance to land is just a few feet. But don’t try to hang by your hands if you don’t have any experience, it’s not as easy as it seems. Potato Chip Rock is situated on the top of Woodson Mountain near the town of Poway in California. It really does look like a potato chip. In some photos, it looks as if there is an abyss under the rock and every person who steps on it is really brave. But in fact, the rock is just several feet above the ground. Entire families come here to take a cool but safe photo. This well-known waterfall in South Africa is on the Zambezi river on the border between Zimbabwe and Zambia. The height of the waterfall is 393 ft which is why the pictures look really cool, but how do people take them? At the top of the waterfall, there is something called the devil’s pool. The water flow there is pretty slow, so there is really no way you can fall. Extreme pictures can be made in the draught season from September to December when the water level is low. The “Swing at the End of the World” is not far from a town called Baños in Ecuador and has been a popular place for cool photos for a long time. It is 8,727 ft above sea level and it’s tied to a charming treehouse. It’s not on the edge of the hill like it appears and if a photo is taken from the ground, it looks as if a person is soaring in the sky in front of a backdrop of mountains. In fact, the distance to the ground is just several feet and sometimes you’ll even see photos of children on the swing. There are special seatbelts for additional safety. 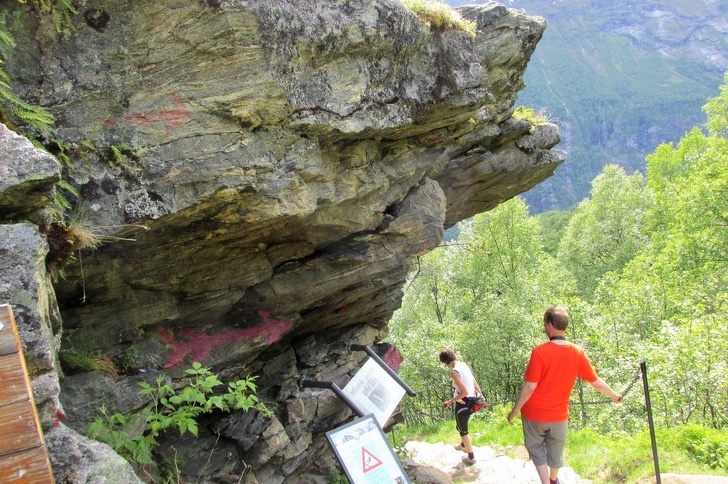 Flydalsjuvet Rock is above Geirangerfjorden at a 1,007 ft elevation. The name of this amazing place is translated as “flying over the canyon.” Every person who comes here takes the risk to get a cool photo on the edge, even though there’s a fence and a lot of warning signs. Here it’s not that easy to just hang over the ground because it’s pretty high. But it’s not hard to take a breathtaking photo because the cliff is pretty wide. If you stay away from the edge and choose the right angle, the picture will be amazing. Storseterfossen Waterfall is also near Geirangerfjorden. This is one of the few waterfalls where you can enter and enjoy the view of falling water from the inside. 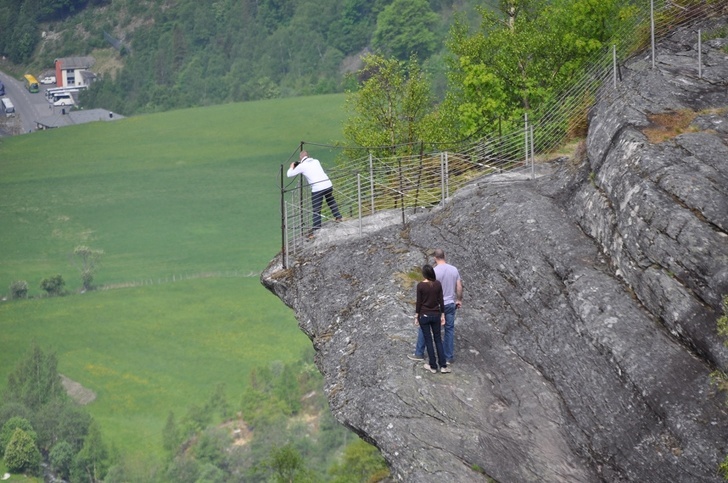 But for brave tourists, the most interesting thing is a small ledge on the way to the waterfall. It’s just a few feet above the ground, but a skillful photographer can easily take a cool photo that will make you look like you’re sitting on the edge of an abyss. Ryten is a mountain on Lofoten Island that is 1,781 ft high. Here, you can find a small ledge that turns into an extreme place for a photo if the angle is right. 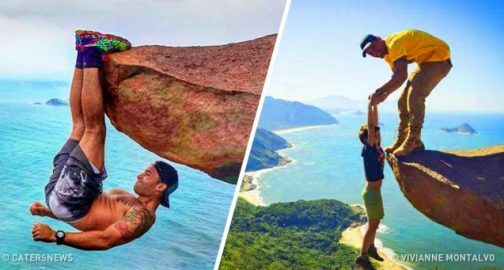 In pictures, it seems as if the rock is several hundred meters above the ocean but in fact, it’s only several feet high so it’s perfectly safe for a picture. Fish River Canyon is in the south of Namibia and it’s one of the biggest canyons in the world — it’s 99 miles long, 16 miles wide and about 1,640 ft deep. The coolest pictures are taken on high ledges. If you sit on one of the ledges, there will be enough free and safe space (around 2 ft above the ground). Given the right angle, there will be an illusion that you are in a very high place. Cânion do Itaimbezinho is in Parque Nacional dos Aparados da Serra in the south of Brazil. It is more than 2,296 ft deep, so it also attracts many tourists who come here to take cool pictures. You can take breathtaking pictures almost anywhere while sitting and pretending that you are right on the edge. But don’t come near the actual edge — stay at a safe distance and experiment with the angles. If you like cool shots in unusual places, then you should be mindful about your own safety and physical state. Don’t refuse to use belay ropes if possible and always ask experienced people to help you. If you had a chance to take a picture in an unusual place on our planet, where would you like to go? Tell us in the comment section below!